Roger Roberts will present “Child Labor Exposed” during the Big Walnut Area Historical Society meeting at 7:30 p.m. Tuesday, April 9, in the Myers Inn Museum Meeting Room. As industrialization emerged in the Western World in the 1700’s and 1800’s, factory owners were always looking to increase profits. One method they found was to cut expenses by using children to work up to 70 hours a week for maybe a dollar in pay. Factory work and other work was most often hard and conditions were unclean and unsafe. Children could be working by age 4 and most often came from poor families which meant there was no time for school or social events. 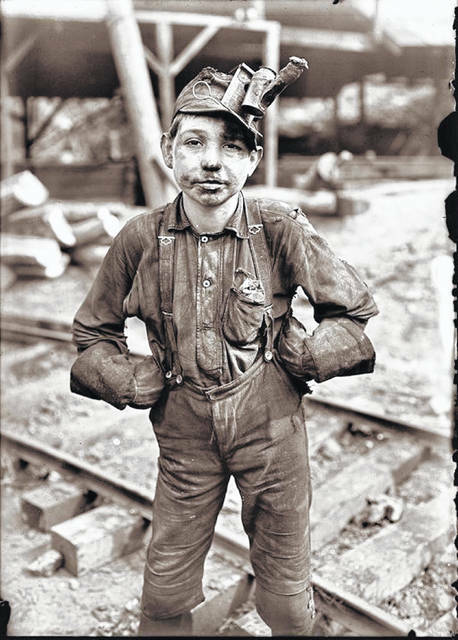 It is estimated that there were around 2 million child laborers by the year 1810. It is estimated that in the early 1900’s as high as 18% of our workforce was composed of children. Sometimes poor families sold their children to factory owners because of finances. Eventually, social organizations took up the cause of the injustice and laws were passed in Britain and Europe to regulate child labor. The U.S. did not pass a Federal Law until 1938, although many states had passed child labor laws earlier. In 1938, The Fair Standards Act was brought about by many working together, but the pictures of Lewis Wickes Hine played a significant role. Hine, a Sociology professor, realized the power of picture images played in moving people to action. Hine found various ways of getting inside factories and other work areas and to take pictures of children at work. The factories had tried to keep the public from seeing images of children working. As the images were published, the outraged public began to put pressure on politicians to act. Hine’s life was often in danger. He was physically threatened, even with death threats. His photographic work for the National Child Labor Committee helped to lead to the passage of the 1938 Act. This presentation will show many of Hine’s picture images of children in their work environment. Child laborers in factories, agriculture, and even on the streets selling newspapers will be shown. They will take us back to a time period of which we are not proud and perhaps stir up emotion within us even today. Many of the images will also tell the story of those in the pictures. Roberts grew up in Delaware, Ohio, and graduated from Delaware Hayes High School and then Mt Union College. Hylen Souders hired him to teach in Big Walnut High School. Roberts went to Xavier University to get a Masters degree. For 38 years he taught social studies in Big Walnut, served as the department chair, was a coach and a guidance counselor. For 18 years he was the advisor for the high school yearbook. Roger married Bette Hoke and they raised their two sons in Sunbury. In addition to his family, Roberts enjoy genealogy, history and Big Walnut sports. He is an active Trustee of the Big Walnut Area Historical Society, plans and coordinates all the programs for the Tuesday evening meetings, and is a docent in the Myer Inn Museum. On the first Saturday night in December, Roger may be seen as Ye Olde Town Crier. Myers Inn Museum is located at the corner of Granville and S. Columbus Streets facing Sunbury Village Square. It is open noon-3 p.m. on Thursdays, Fridays and Sundays and 10 a.m.-3 p.m. on Saturdays. Admission is by donation. Learn more about the historical society and the Myers Inn Museum at http://BigWalnutHistory.org.